Long time readers of the blog know that we put a lot of work in to running the Microbrewers Festival each year. As a result, we have found ourselves an entire month behind on the Beer and Cheese Club. 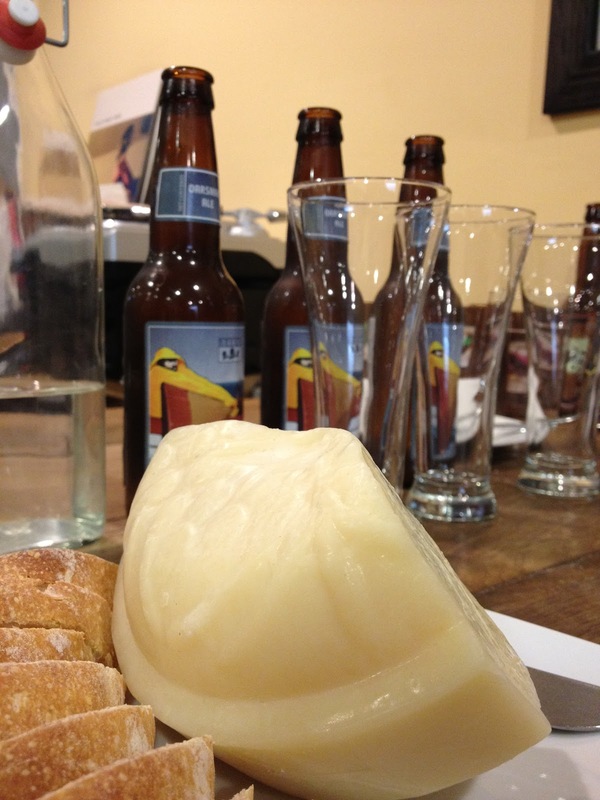 Never fear, we are still dedicated to pairing great beer with great cheese and we will get back on track! However we certainly weren't going to skip a month, this stuff is too good! 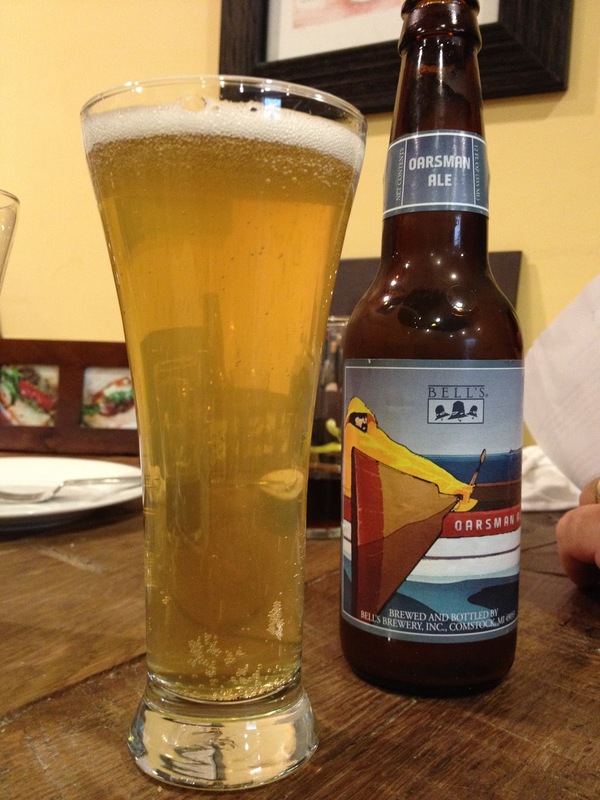 In the month of July, the Beer and Cheese Club subscribers found themselves with a possibly familiar friend - Bell's Oarsman. This American take on the classic German style of Berliner Weisse has recently found its way in to Bell's year-round lineup. 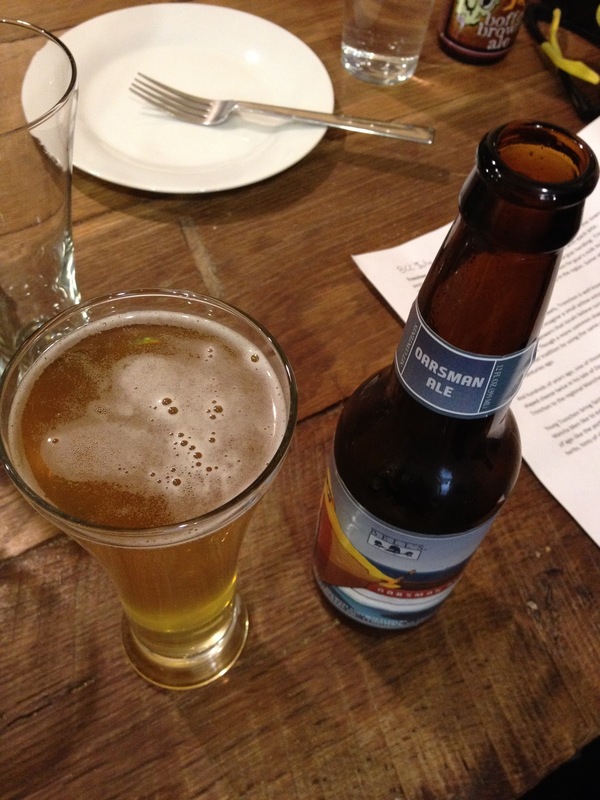 It's lower ABV and slight fruity notes make it a very refreshing summer beer. Its tartness is subdued compared to the traditional Berliner Weisse, which makes it much more accessible to beer drinkers that aren't familiar with sour beers. We hope you like it, as Beer and Cheese Club subscribers will be taking home a six pack of it (or already have). Tronchon, was quite literally chosen this month because of its whimsical doughnut shape. You may have noticed the curvature in your slice! Luckily, our choice based on our own amusement was met with a unique cheese that we were immediately fond of. The style originates in Spain and is a blend of sheep and goat milks. Here's an interesting factoid for you - The Man of La Mancha himself preferred Tronchon to Manchego. That should impress your friends! 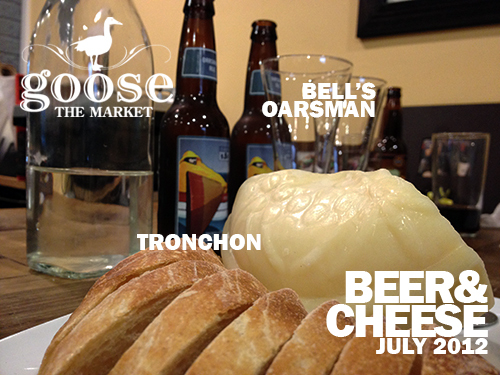 If you're a member of the Beer and Cheese Club at Goose the Market, your July installment was ready for you to pick up a month ago, so we hope you already have! If you're not a member, the club is $99 for 4 months. This month's delivery includes a 6-pack of Oarsman and nearly a pound of Tronchon. Either of these items would be great experiences on their own, but we feel they are even better when consumed together. I will keep my review short for this pairing. Rod and Jason sum up my thoughts about this pairing much better than I can put into words this time around. 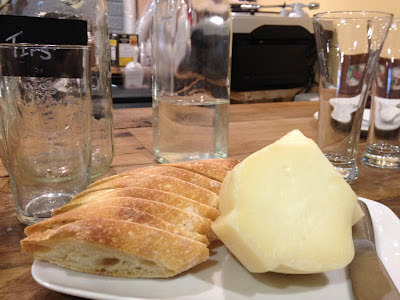 The Tronchon cheese has a wonderful buttery flavor and dense texture. 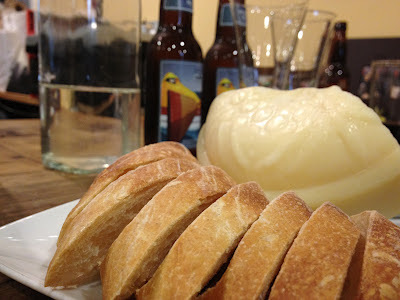 I actually preferred the cheese all by itself over any pairing including with the beer or on a piece of bread. I thought the cheese was the big winner in this pairing. That isn't to say that I didn't enjoy the oarsman, but the subtle sour twinge and grassy notes didn't work for me. I much preferred each of these items on their own merits than I did as a combo. I think it came as a surprise to Rod when I said that I enjoyed Bell’s Oarsman Ale. Yeah, there is a slight tartness, but it is not the lead singer. It isn’t even a back-up singer. The tartness is the girlfriend in the back playing the tambourine. The wheat and citrus notes play a larger roll, taking the edge off of the tart flavor. But all together, the wheat, citrus, and tart play well with the nuttiness of the Tronchon. Apparently when this Spanish cheese is young, it’s a bit squeaky. I believe our piece had a little age given the rind that had formed. Inside was a cheese that was slightly dry but with a clean finish. Very unique and very enjoyable. When tasting Tronchon, there is a distinct tangy flavor to the cheese. Similar to a simple soft chevre, but balanced with the bite of a mild cheddar. This is most definitely an interesting cheese and my first thoughts were of a lightly sour beer with fruit notes. Enter Oarsman. This is a beer that I find very nice during the summer. I wouldn't quite call it a sour beer or a Berliner Weisse, but it has that nice refreshing lemonade quality to it. Peaches and lemon are both present in the aroma, as well as a hefty dose of yeast and a hint of funk. Peaches and citrus comes through in the sour character of the beer and the finish is that of an American wheat. The pairing is a new one for me. The peach and citrus flavors work well with the tangy flavor of the cheese, while the sourness of the beer is just enough to cleanse the palate but not enough to overwhelm. The result is a heavier wheat body to the beer and a cheese sharp enough to hold up to the sour flavors. I'm liking it, and with the huge amount of cheese and beer everyone got this month, it's plenty to share with friends.